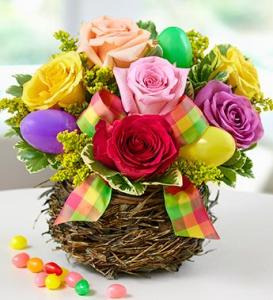 Vibrant multicolored roses, reminiscent of pastel Easter eggs, are hand-designed in a charming bird's nest basket, accented with a bright ribbon and festive plastic Easter eggs. 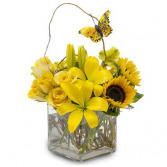 A terrific centerpiece arrangement or hostess gift! Here’s a gift that proves big things come in small packages! 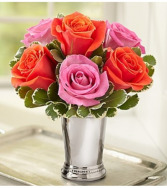 Beautifully designed as a stylish compact arrangement by our expert florists, it gathers six fresh, blooming roses in a shimmering julep cup vase that’s perfect for brightening birthdays, romantic get-togethers or "just because" days. A cube of nature and sunshine to make someone's day. Add bright smiles to their day with this sparkling surprise! 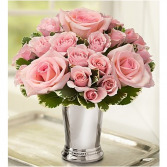 A handcrafted bouquet of fresh roses and petite-bloomed spray roses, in your choice of sunny yellow, pretty pink or lovely lavender are gathered with love by our expert florists inside a shimmering julep cup vase, creating the perfect mix of classic and contemporary.